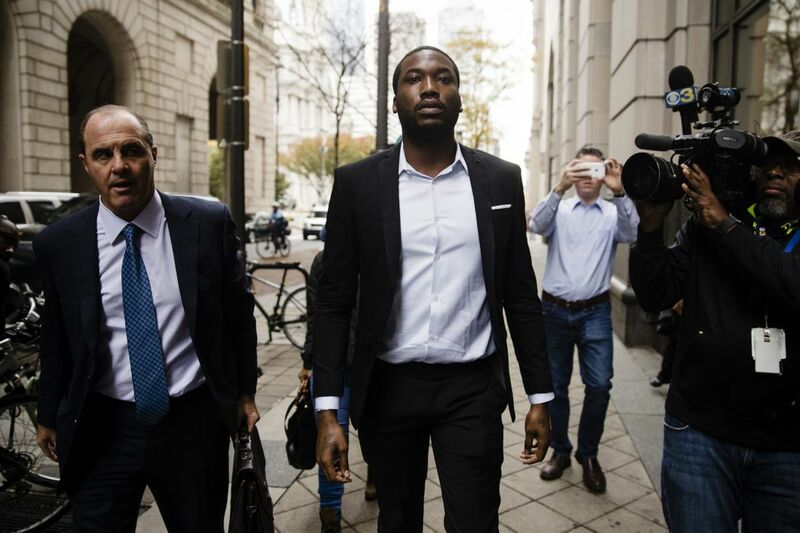 Rapper Meek Mill, center, accompanied by defense attorney Brian McMonagle, arrives at the criminal justice center in Philadelphia, Monday, Nov. 6, 2017. Seven times in the last four years, Philadelphia Common Pleas Court Judge Genece E. Brinkley has sent men off to state prison for violating their probation, only to see them challenge her in appeals. Not until Monday, when Brinkley added Philly-born rapper Meek Mill to the list, did the public seem to notice. But despite their cries of injustice and internet petitions for his pardon or her removal, the claim by Mill's fans that the two- to four-year prison term was unusual or excessive might not hold up — if history is a judge. A review of other Brinkley sentencings of probation violators shows that Mill's punishment was not an outlier. And every time, her decisions have been upheld by a higher court. In fact, a review of the Superior Court opinions in those seven cases shows that Brinkley, 61, a city judge since 1993, often follows the same pattern: probation extensions that drag on for a decade or more, followed by a final violation that carries a lecture in which Brinkley berates the probationers for blowing multiple chances at redemption and "thumbing your nose at the court." That was the same message she gave Mill before sending him back to prison for violating the terms of his probation: testing positive for the prescription narcotic Percocet, and misdemeanor arrests this year for an altercation at the St. Louis airport and a traffic violation involving his motorcycle in Manhattan. The appeals documents also offer a window into a judge — a Nashville native and 1978 graduate of Spelman College, with a law degree from Temple University — who has quietly served on the city's Common Pleas Court for a quarter-century but now finds herself at the center of a media maelstrom for her handling of the 30-year-old hip-hop star born as Robert Williams. Brinkley has declined to comment, restrained by the judicial code of conduct from publicly commenting about a pending case. Still, the judge can find comfort that her future is playing out in the insular world of the appellate courts, where her words, reduced to a written opinion depending on law, precedent, and the record she created, will be judged. It's a far different place from the turmoil of the internet or the electric, high-decibel live performances and recordings that have made Meek Mill an urban superstar. In the aftermath of Monday's surprise sentencing, Mill's lawyers pledged to legally challenge the judge's ruling. But as of Friday, no such appeal had landed. Lou Natali, a retired veteran defense attorney who, since 1990, has been a Temple University law school professor, said he thought Mill's odds of success were long. "He's not going anywhere with a claim of an excessive sentence or abuse of discretion. There's no law that helps him on that," said Natali. As to the judge's punishment, "I think most people would say, 'What took you so long?' "
Samuel C. Stretton, a Philadelphia defense lawyer, said the Superior Court, an intermediate appeals court between the trial courts and the state Supreme Court, has such a heavy caseload that many consider it "mostly a rubber-stamp court." Still, Stretton said he believes Brinkley's sentence was "excessive and an abuse of discretion," and he was critical of Brinkley's record with probationers. "My problem is that she takes these things very personally," Stretton said. "I think her intentions are good, but you can only go so far as a judge with those kind of intentions." Stretton said that Brinkley's probationers remain under her control for too long, and when they violate her rules, as most probationers will, "it becomes personal: 'I'm trying to change your life, I'm going to do good for you.' "
"That's the problem," Stretton said. "When you are a judge, you can't become their therapist." At Monday's hearing, Brinkley recounted the night she actually tried to verify Mill was feeding the homeless, part of the community service she ordered. She went to a Center City soup kitchen run by the Broad Street Ministry — and found him instead sorting clothes. "It was only when you realized that I came there to check on you that you decided to serve meals," Brinkley told him. Philadelphia Common Pleas Court Judge Genece E. Brinkley. Despite her decades on the bench, Mill's is by far the highest-profile case of her career — and one that has been languishing in and out of the headlines since his 2008 conviction in a drug and gun case. He was released from prison in 2009, but Brinkley revoked his probation and sent him back in 2014 for a few months for failing to give his probation officer a working phone number and traveling out of state without permission, among other violations. Mill's lawyers challenged that decision, too, all the way up to the state's highest court. Their emergency appeal contended that Brinkley overstepped her authority by trying to transform him into a person more to her taste. The Supreme Court rejected the appeal without comment a month after it was filed. The record shows the judge treading the same path with other defendants. Take the appeal of Herbert Cottrell, arrested Dec. 4, 2004, for retail theft. Six months later, Cottrell pleaded guilty, and Brinkley sentenced him to three to 23 months in prison, followed by one year of reporting probation. Brinkley paroled Cottrell from prison in October 2006, and he immediately ran into problems. He never reported to his probation officer and racked up three arrests for retail theft in the next few years. Back before Brinkley in October 2009, she sentenced him to 11½ to 23 months in prison, ordered Cottrell to attend drug treatment, get vocational training, seek and maintain employment, and stay out of trouble. He didn't. Paroled to a halfway house and then a drug treatment center, Cottrell was arrested for retail theft in April 2012. Six months later, he stood before the judge. "Each time this court gave [him] the opportunity to avoid state prison and turn his life around through county programs," Brinkley said then, "[he] showed complete contempt for this court's orders and continued to do what he wanted to do." Cottrell's sentence: two to four years in prison followed by seven years of probation. Now 51, Cottrell is in the state prison in Graterford in Montgomery County. Cottrell appealed to the Superior Court, calling Brinkley's sentence excessive for a "technical violation" of his probation. In December 2013, the Superior Court affirmed the sentence, citing among other things "the well-reasoned opinion of the Honorable Genece E. Brinkley." The problem for anyone appealing a sentence for violating probation is that state appellate court rules give broad discretion to the sentencing judge, and appeals judges must not reverse that sentence "unless the record discloses that the judgment exercised was manifestly unreasonable or the result of partiality, prejudice, bias or ill-will." Moreover, one of the stated grounds for sentencing an errant probationer to prison is that the sentence "was essential to vindicate the authority of the court." Mill's best bet to successfully challenge his sentence might depend on the truth of his most serious allegation: that in a private meeting, the judge asked Mill last year to record a version of a Boyz II Men ballad called "On Bended Knee" and mention the judge in it. According to Joe Tacopina, a lawyer for Mill based in New York City, Mill laughed off the request and told Brinkley: "I can't do that. It's not my music. I don't sing that stuff. And I don't do, like, you know, shout-outs to people in my songs." Tacopina said Brinkley responded by saying: "OK, suit yourself." Tacopina was not in the in-chambers meeting, which was requested by Mill and then-lawyer Frank DeSimone. The transcript of the meeting remains sealed — at the request of Mill and his lawyers. Both Natali and Stretton agree that, if the allegations about the private meeting with the judge are true, Brinkley should have recused herself from further involvement in the case. "But they're going to have to prove it," said Natali. Stretton also said he believed it was a mistake for Brinkley to have allowed a private meeting in the middle of the probation-violation hearing. "This was a criminal proceeding," Stretton said. "Everything should have been done in public in open court."